Board Game Night – every Wednesday! Reviewed by Edgeville Buzz on January 12, 2011 . Board Game Night – every Wednesday! 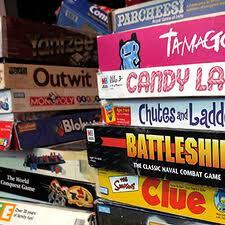 Every Wednesday night starting about 6 PM we have open board game play until extremely late at night. In fact we do not close until the last game is over… Some of our favorites include Arkham Horror, Puerto Rico, Battlestar Galactica, Tribune, Smallworld and Dominion. There is no charge for this event and people are encouraged to bring games or to borrow one from our 300+ game lending library. We typically have a good mix of 20-30 new and experienced gamers. It is a very friendly crowd and everyone is willing to learn or teach a game.